Sen. Ron Wyden, Rep. Bonamici and Attorney General Ellen Rosenblum gather at their own synagogue. "Wherever you go, I will go," Ruth once said to Naomi. "And your God will be my God." 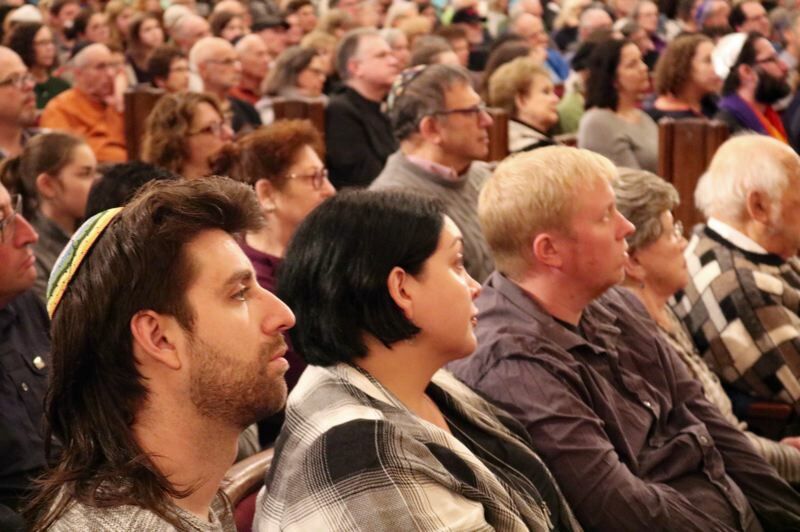 With songs, speeches and quotations such as that one from the Hebrew Bible, believers of all faiths united for peace and religious solidarity in Northwest Portland in the aftermath of a deadly mass shooting at a synagogue in Pennsylvania. "We stand shoulder to shoulder with the Jewish community right now," Gov. Kate Brown said in an interview with reporters after an hours-long vigil at Congregation Beth Israel, 1972 N.W. Flanders St., on Sunday, Oct. 28. "The levels of bigotry and hatred and discrimination happening in this country are outrageous and we will all work to stomp it out," she continued. 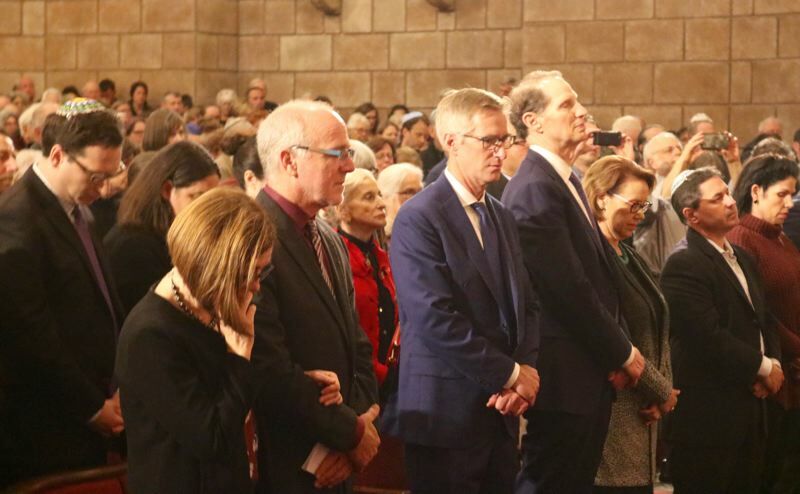 With only a few hours notice, a standing-room-only crowd of hundreds filled the sanctuary of the Jewish temple, singing "We Shall Overcome" and traditional prayer songs while listening to words from more than a dozen faith leaders and elected officials. The somber gathering was spurred by the deaths of 11 congregants — many senior citizens and one a Holocaust survivor — at the Tree of Life synagogue in Pittsburgh on Saturday. A gunman armed with an AR-15 semiautomatic rifle also wounded four police officers and others, reportedly telling a SWAT team he "wanted all Jews to die" before surrendering alive to the authorities. The massacre is believed to be the deadliest incident for American Jews in U.S. history. "They're not alone in their despair," said Portland Mayor Ted Wheeler. "We're here today to reaffirm our commitment to nonviolence." 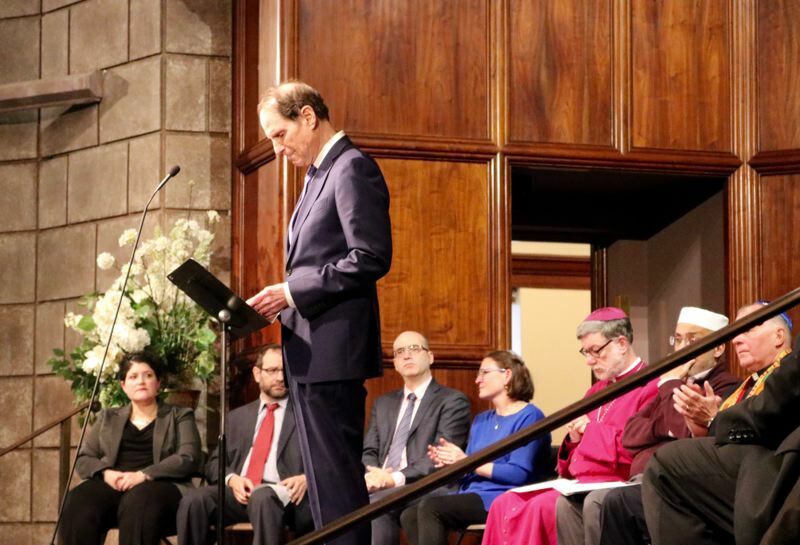 Wyden and Oregon Attorney General Ellen Rosenblum are also both members of Beth Israel. Rosenblum read a statement from Pennsylvania Attorney General Josh Shapiro and reminded listeners of her recently-created hate crime task force, which will travel around the state soliciting testimony. A spokeswoman for U.S. Attorney for the District of Oregon Billy Williams expressed regret that Williams could not attend in person because he is out of town. Rabbis from several local Jewish congregations spoke, as did representatives from the Catholic and Muslim communities. Rabbi Rachel Joseph of Beth Israel said the temple was hosting a bar mitzvah celebration on Saturday when word first circulated of the deadly attack. Joseph encouraged the crowd to introduce themselves to their immediate neighbors sitting in the sanctuary. "If we're going to change anything, its comes through face-to-face communication," she said. "We cannot be Jews alone."